Least Weasel photo, Wrangell - St. Elias National Park, Alaska. Least Weasel photo, Wrangell – St. Elias National Park, Alaska. 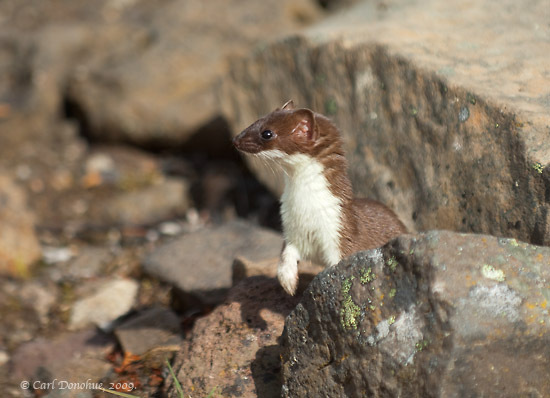 In the meantime, this photo is of a weasel (or ermine), from Skolai Pass. Member of the mustelid family, the Least Weasel is the coolest little critter . imagine a small, sleek ferret on crack. I’ve never tried to photograph an animal where I go so many images of his behind, as he raced off, or even with the animal completely gone .. this guy was SO fast, I barely managed to catch him at all .. the few moments he’d stop, look around, pose, and be gone, in a dash for cover. This photo is about 60% of the full frame version. This photo was maybe a few hundred yards into our walk, so it was exciting. To be shooting a cool little guy like this within minutes of starting our trip was simply awesome. On the first day of our trip I managed to take my only images of a weasel from the park, my now favorite caribou image I’ve taken in the park, and my favorite image of Mt. Bona. And earlier in the morning we’d had some alpenglow on Mt Blackburn, as well. What a day. So that’s it for the weasel. He’s running around Skolai Pass chasing voles, shrews and ptarmigan, and maybe the odd ground squirrel. I hope has a great winter, and is around to see again next year. What a treat it was for our group. I’ll be back early October. This entry was posted in Alaska, Small Mammals, Wildlife, Wrangell - St. Elias National Park and tagged ermine, Least Weasel, mammals, mustelids, Skolai Pass, weasel, Wildlife, Wrangell - St. Elias National Park, Wrangell St. Elias on September 25, 2009 by Carl D.
Sweet Carl! This is an animal I don’t have any photos of – they are quick little guys. I’ve managed to grab a few, some from the Arctic National Wildlife Refuge as well, but this was my first in Wrangell – St. Elias. I’d really love to get a chance to see and photograph a weasel in the winter, when they turn all white, but so far, no such luck. Mustelids, it seems are our nemesis; I don’t have a pine marten either, and have never even seen one. Trickster critters, I call ’em.